Don't be intimidated by all the snooty art aficionados and cultural critics out there. Art history is a vibrant world of interesting characters, fascinating political and historical backstories, and so much beauty, wonder, and appreciation for the simple and lovely things in life. You can start an art history study in your homeschool, even if you don't know a van Gogh from a Miro. Start before you are ready! I love this philosophy. It takes all the hesitation out of things that seem too complicated, too big, and like they need a lot of planning. Art appreciation doesn't require any planning! Just find a museum and go. Learn while you're there. Research things that interested your kids when you return home. (If you really feel like you need a game plan before you attempt a trip to the museum with your kids, I have one here... but trust me– you don't really need a plan. Just go! Visit the library or book store and browse the art section. Don't limit yourself to the kids section, either! There are so many great storybooks about famous artists, but kids can have just as much fun flipping through art history textbooks, coffee table books, or more traditional art books for adults. Let Pinterest inspire you! Search an artist or art movement your kids are interested in, or something that goes along with what you are studying in another subject. Pinterest is an endless source of amazing tutorials and project ideas that show you step by step what to do. If your kids see you wondering aloud about why Mondrian painted only with primary colors, what was impressionism really all about, or if Andy Warhol really was the quirky character everyone says he was, they will start to wonder, too. You don't need to know the answer. Just come up with some questions, and then show your kids how to find the information that will help you all understand a little bit more about the art, artists, and art movements. After a while the pieces will all start to fall together as you learn more and more. Art history doesn't have to be all stuffy and full of memorization and flashcards. In fact it should look nothing like that! There are dozens of fun games, puppets, toys, and coloring books to get acquainted with various artists. Search amazon or the museum shop at your local art museum. Learning through play adds an element of creativity and spontaneity that definitely compliments this kind of exploration. Ok, so you've seen the latest museum exhibit, inspired your kids, and now they're excited to create their own art. When you're ready to organize a great art area for them, it doesn't need to be overwhelming or complicated. Start simple, and build over time. I've got an easy to follow plan that takes all the guesswork out of buying art supplies and setting up a great art area. You're not on your own... there's a whole community of supporters ready to help you! 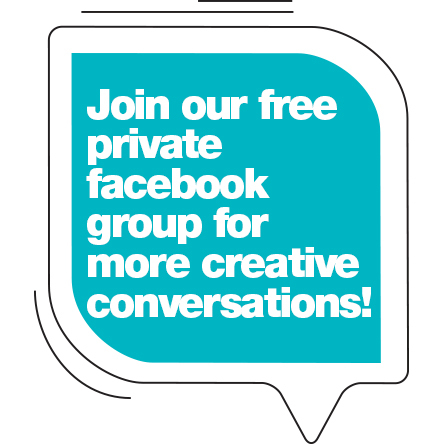 I've started a fun private Facebook group for moms and teachers just like you. We've got almost 200 members who love to share photos of their kids artwork, exchange project ideas and book recommendations, and just support each other in our common quest to inspire our kids with art and creativity!